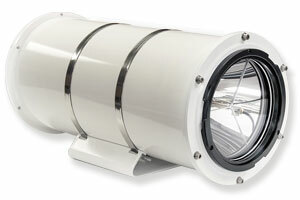 Specifically designed for harsh maritime conditions, the Watertight Enclosure is constructed of 6061 passivated aluminum and provides a secure, weatherproof environment for the Maxa Beam Searchlight. The Searchlight’s lamp is rated at 1000 hours and the user-controlled strobe function features a variable 1-31Hz rate and 3-63% duty cycle. Any Maxa Beam filter can be quickly attached and detached from the front of the enclosure. All Enclosure systems ship with (1) Adjustment Tool, (1) Operation Manual, (1) Interface Control Document (ICD), (1) Graphical User Interface (GUI) software CD and (1) kit with either one or two Mating Connector(s) and Back Shell(s). Choose the searchlight input voltage, control type and number of connectors to optimize a system for your application. The U.S. Border Patrol has installed several Maxa Beam Watertight Enclosure Systems that are being used as a remote-controlled illumination tools on the U.S.-Mexico Border.